“A fellow up the road measured over 20 inches of rain,” Don Lee said as he slapped away the mosquitoes spiraling up from a muddy field underfoot. “Look around and you can tell where the wind came from. And my word, it just seemed like it wasn’t ever going to stop.” I followed his gaze across a 40-acre field of narrow-leaved sunflower, a Southern native, that looked as if it had been steam-rolled. The wind came from the north, and it stomped over every single deluge-battered plant. Normally this field is shoulder tall and so brilliantly blossomed you can hardly look at it in bright sunlight. No longer. By the time the rain and the wind did let up, much of Lee’s Garrett Wildflower Seed Farm in Johnston County, North Carolina, had been leveled. The story of Lee’s family farm and his quest to bring back the native grasses and forgotten wildflowers of the South struck a chord with Garden & Gun readers last spring. 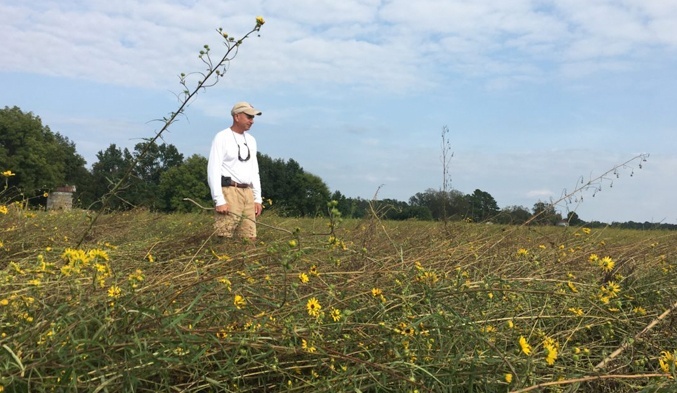 When I called this past week to see how his family and farm held up during Hurricane Florence, Lee couldn’t hide his anguish: At least one-third of Garrett Wildflower Seed Farm’s 1,500 acres of native seed crops had fallen to the storm’s mind-boggling rains and winds.